Get the most out of Pathfinder Module: The Dragon's Demand with this custom-made assortment of characters, treasures, and more! Item Cards help you track all the best items and equipment. Face Cards depict the most important NPCs, and new Quest Cards summarise key adventure goals to keep players on track. 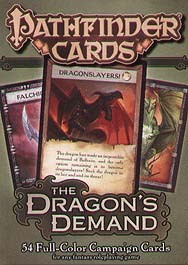 Designed specifically for use with Pathfinder Module: The Dragon's Demand, this beautifully illustrated 54-card deck is easily the greatest treasure in the dragon's hoard!